This anthology provides a unique collection of articles on classic grounded theory, as developed by sociologist Dr. Barney G. Glaser. Organized in four sections, teaching grounded theory, techniques, history and philosophy, and advanced approaches, the 19 chapters fill gaps and correct misunderstandings about the method. Chapters on the merits of classic grounded theory over other versions, the historical and philosophical influences on the method, and advice for Ph.D. students doing classic grounded theory dissertations will be useful to novice and experienced researchers. How-to chapters on the use of focus groups, online interviews, and video for data collection expand data possibilities, while articles on formal theory, software, and testing concepts with structural equation modeling will challenge the more experienced. 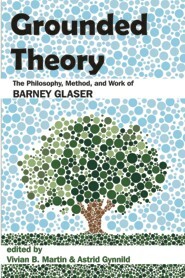 Essays on Glaser as a teacher, as well as a biographical interview in which he discusses his life philosophy and, for the first time, the influence of psychoanalysis on grounded theory, round out the picture of Glaser as mentor and man. The book’s contributors, from nine countries and as many disciplines, all studied grounded theory with Glaser. Vivian B. Martin directs the Journalism Program at Central Connecticut State University, where she is an associate professor. A former newspaper journalist and magazine writer, Martin continues the grounded theory research on news in everyday life she began as a doctoral student, publishing several well-cited articles related to her theory of purposive attending. She teaches journalism and has taught qualitative methods, including grounded theory, to graduate students. She has organized troubleshooting seminars in New York City for the Grounded Theory Institute and is currently developing a formal theory on discounting awareness. Astrid Gynnild is a post-doctoral researcher at the Department of Information Science and Media Studies, University of Bergen, Norway. She received her Ph.D. from the same university in 2006, with a grounded theory of creative cycling of news professionals. Astrid specializes in innovation processes in computational and audiovisual journalism online, and in journalism education. Her background is in journalism and newsroom development and also counseling and supervising. Gynnild is the author and co-editor of five books, including two on grounded theory. She is a fellow of the Grounded Theory Institute and sits on the editorial board of the Grounded Theory Review.